Lift trucks are commonly found in metal fabricating and manufacturing operations. They’re often used to move steel materials around metal fabricating facilities because they’re familiar and operator training is quick and simple. Oftentimes, these facilities have been using lift trucks for a long time, and making the switch to an overhead crane system seems costly and overwhelming. But, lift trucks can be unsafe and time consuming, particularly in crowded shops and with narrow, confined spaces. 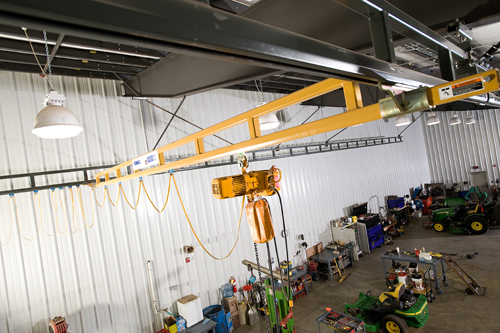 Some facilities already have an overhead crane system that’s being completely underutilized. Perhaps the crane came with the building, or maybe it was installed for infrequent service or to move a heavy load when a lift truck isn’t available. If your facility has an existing overhead crane but you are still using lift trucks in your operation, it may be time to re-evaluate your material handling procedures. Consider having your system inspected, and then determine if it’s really being used to it’s full potential. Some manufacturers avoid making the switch from lift trucks to overhead crane systems because they are worried about cost and downtime. We’re here to remove the myths surrounding overhead cranes, and to outline the benefits of installing a carefully selected overhead crane system to replace those old, cumbersome forklifts. If you’ve been thinking about replacing your lift trucks with overhead cranes but you’re worried about cost or downtime, think again. Any worker who has used an overhead crane to move a heavy load in a crowded facility will tell you that the long-term benefits outweigh the inconvenience of buying and installing, ten to one. Lift trucks serve a specific—albeit important—purpose. But, lift trucks aren’t the most effective material handling solution for metal fabricating and manufacturing operations—especially in a crowded shop with little floor space. For this type of facility, an overhead crane is not only more effective, it’s also less cumbersome, safer, and easier to manage. Lift trucks are a great material handling solution in some industrial environments. But, in a crowded facility or when your operation requires a more comprehensive lifting solution, lift trucks are usually more inconvenient than beneficial. Overhead cranes allow workers to transport materials from one end of a shop to the other. They’re precise, ergonomic, and practical. Some cranes, like ceiling-mounted bridge cranes, are easily installed or interconnected to run the entire length of a facility. With a material handling system running the length and width of your building, a single crane operator can control the hook from any point without sacrificing load control. 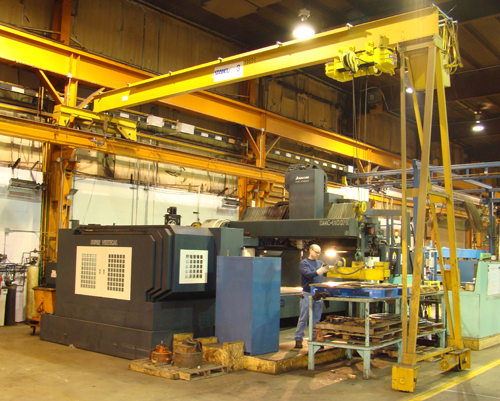 A major benefit of using an overhead crane system is that the same job requires less manpower. Forklifts usually require one driver and one director, whereas overhead crane systems require only one worker. The increased control over lifting and positioning a heavy load not only improves productivity, it also benefits workflow, and provides a significantly safer material handling solution. Coordinating multiple forklifts, especially on heavy or bulky loads, is unsafe, ineffective, and time-consuming. Cost is always a factor when transitioning from forklifts to overhead cranes. But, fear not; we have some great suggestions for cost effective lift solutions that are guaranteed to improve productivity without breaking the bank. Some manufacturers may fear that they don’t have the budget to retire their forklifts and purchase new overhead cranes. But, the cost associated with an overhead crane system will pay for itself in improved workflow, increased efficiency, effective distribution of labor, and workers’ safety. Even so, it’s important to consider cost when determining which type of overhead crane system is best for your budget. That’s why we’ve provided a breakdown of the most popular overhead cranes for metal fabricating and manufacturing—starting with the most economic solutions available. While all overhead cranes pay for themselves over time, the gantry crane is usually the most cost-effective, depending on your application. The following information provides a comprehensive look at some of the most popular overhead crane systems for metal fabricating and manufacturing—from least to most expensive. Here, we have listed each general crane type, followed by specific design and mounting options that work best in crowded manufacturing facilities. Gantry cranes are a great material handling option for operations requiring cost efficiency and portability. Gantries are floor supported and can be mounted on four wheels or track mounted for manual or motorized travel over a fixed route. These systems are made from steel, aluminum, or both. A hoist is connected to a steel or aluminum I-beam, which is supported by the gantry’s legs. Gantry cranes are ideal for operations requiring a portable solution, or for materials that need to be transported from one building to another. They’re highly mobile and, manual gantries require no installation. If your gantry crane is track mounted, the track will require some installation. But, many manufacturers offer trackless drives for facilities that need to keep the shop floor clear of tracks or angle guides. The trackless drive is a great option for metal fabricating facilities; a selector switch in the control pendant turns each motor on and off to maintain alignment and guide the gantry along its path. There are dozens of gantry types, depending on the crane manufacturer, and each one serves a specific purpose. Single leg gantry cranes, for instance, are a great option for metal fabricating facilities that can’t use a standard gantry due to narrow, confined spaces or crowded machinery. A single leg gantry (also known as a semi gantry) is an excellent alternative to expensive overhead cranes. That’s because they are extremely cost effective and space efficient. Single leg gantries maximize floor space because only one leg moves over the floor while the other end runs overhead on a wall-mounted I-beam. Single leg gantries offer high capacity, high height, economical lifting solutions. But, these overhead crane systems are particularly useful when your lifting volume is moderate, and you can’t justify installing a permanent, more expensive overhead crane. They’re also a popular solution for facilities looking to supplement their existing overhead crane. Single leg gantries can be top running or under-running, depending on their end truck design. Top-running gantries travel on the topside of the overhead runway beam. Under-running gantries travel on the bottom flange of the overhead runway beam. Under-running gantries are a great option for facilities where headroom is an issue or overhead obstructions won’t allow for a top-running system. Jib cranes are a fantastic solution for isolated or size restricted work areas that require an overhead lift system. These cranes are economically viable, particularly because they can maximize production, improve worker safety, and reduce manufacturing costs. Jib cranes offer the highest capacity lift, and provide lifting coverage in semi or full circles using rotating booms. A jib crane includes a pivoting head and boom assembly, which is where the hoist is attached. Jib cranes can actually be floor mounted or column/wall mounted. A floor-mounted system offers 360-degree rotation, which is great, but it doesn’t alleviate concerns about floor space. A wall-mounted jib is a great solution, but a regular wall-mounted jib crane only offers 200-degree rotation. That can be limiting in operations like metal fabricating, where precision and control are imperative. The best solution in these instances is an articulating jib crane that’s been ceiling-mounted. This is a highly effective option for metal fabricating facilities with limited floor space. They provide extensive headroom, which allows them to be easily installed in tight spaces or facilities with low ceilings or crowded work areas. The articulating jib arm can reach effortlessly into machines to lift and transport materials with in a particular work area. Articulating jib cranes include one outer arm mounted to an inner arm. Both arms provide 360-degree rotation, while the outer arm is used to lift materials. Without having to install costly steel support structures, ceiling-mounted articulating jib cranes are more economic than freestanding jib cranes. And, mounting them to your existing overhead structure means they won’t sacrifice precious floor space. Articulating jib cranes can also be floor mounted or mounted onto existing bridge cranes to supplement your current lifting system. 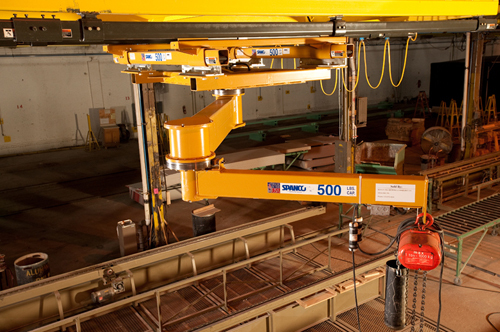 These cranes support nearly any type of manipulator, balancer, or hoist. Most manufacturers offer electrification options, and some even offer internally piped air power for articulating jib cranes. Overhead bridge cranes are the ultimate lifting solution for manufacturing and metal fabricating operations. These systems are by far the most advanced in terms of engineering and design. They offer the highest level of versatility, and they are capable of replacing multiple jib or gantry cranes to provide one fluid, comprehensive material handling solution. In fact, the overhead bridge crane can run the entire length of your building, if necessary, and empower one worker to move loads to and from multiple work areas. An overhead bridge crane system consists of one or more traveling bridges mounted to parallel runways to create a rectangular coverage area. These bridge cranes operate on the x- and y- axis, which means more flexible hook motion. The hoist is connected to the bridge, where it can travel back and forth, side to side, and up and down, as needed. Overhead bridge cranes have two support options—freestanding (stand alone) or ceiling-mounted. Overhead bridge cranes are durable, efficient, and can be fully customized to meet the unique needs of your specific application. Plus, most manufacturers can provide options like telescoping or cantilevered bridges, which allow workers to reach beyond their coverage area and around or under existing columns and overhead obstacles. Ceiling-mounted overhead bridge cranes are the perfect installation type for busy, crowded shops with ground level obstacles. These systems require no floor space and can be easily mounted to your pre-existing structure. The system is easily hung from existing roof beams or trusses, and allows you to readily expand runway lengths and the number of bridges or add links to monorail crane systems. Because they don’t require floor mounting, they eliminate the need for expensive steel supports, making them highly cost effective and ergonomic for any manufacturing facility. Overhead bridge cranes can be made from steel, aluminum, or both. Aluminum enclosed track bridges and runways reduce the overall weight of the system, which means less weight on your overhead support structure. They’re a great option for facilities requiring a lightweight overhead crane system, but they can be more costly than standard steel overhead bridge crane systems. Overhead bridge cranes are not only considered the workhorse of the overhead material handling industry, they can also be surprisingly versatile. A ceiling-mounted system with a telescoping bridge, for instance, can provide complete access to even the most confined areas in your facility. Telescoping bridges provide extended crane reach, allowing you to easily place parts into machinery or other workstations. They also enable workers to reach beyond support columns and under mezzanines. This is a great solution for narrow or busy manufacturing facilities, or in metal fabricating operations where materials need to be lifted in and out of areas that are inaccessible to lift trucks. It’s important to remember that for every material handling problem there’s a solution. The same goes for making the switch from lift trucks to overhead crane systems in your manufacturing facility. Talk to your local material handling distributor, and be sure to outline your concerns, along with the needs of your application and facility. The right solution for your operation might be pre-engineered, or perhaps it will require a custom overhead crane system. Either way, a good distributor will work with you to ensure you’re getting a system that meets all of your needs—including space requirements and your annual budget.